A Wrinkle in Time review: "DuVernay tackles a difficult adaptation with heart"
Reid’s a fine lead, but DuVernay’s usually firm footing wobbles in the CGI clouds of Disney fantasy. To understand how tricky Madeleine L’Engle’s 1962 children’s fantasy novel is to adapt, just hop back in time. In a mind-boggling what-if prospect, Stanley Kubrick was pursued to direct in 1979. But movie history remained unchanged as he passed on it, meaning nothing emerged until 2003’s messy TV movie showed what a tough nut the novel is to crack. Despite clear points in its favour, Disney’s latest try leaves the nut uncracked. Boasting a biracial heroine and the first directing credit from an African American woman (Ava DuVernay) on a $100m-plus tentpole, Wrinkle presents certain vitals – compassion, ambition, scope. What’s less welcome is writers Jennifer Lee (Frozen) and Jeff Stockwell’s tendency to bridge L’Engle’s leaps of faith, fantasy, anti-conformist thinking and quantum science with mawkish messages and expository filler. It’s hard to say whether DuVernay’s use of garish CGI and music-pumped montages betray a struggle with the script or with fantasy per se (following the real-deal rigour of 2014’s Selma). Either way, the wrinkles show. 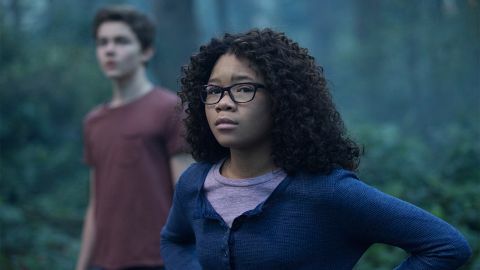 DuVernay is at her strongest early on, ensuring that Storm Reid’s turn as troubled teen Meg Murry offers something for the audience to connect with in the face of all the exposition. Haunted by the disappearance of NASA scientist father Alex (Chris Pine), Meg’s hope that he’ll return is stoked when perky celestial irritant Mrs. Whatsit (Reese Witherspoon) turns up, upsets Meg’s mum (Gugu Mbatha-Raw) and confirms Dad’s theories about tesseracts. Before long, Whatsit joins fellow astral Mrs-es Which (Oprah Winfrey) and Who (Mindy Kaling) to whisk (or “tesser”) Meg, her brainy adopted sibling Charles Wallace (Deric McCabe) and schoolmate Calvin (Levi Miller) on a trans-dimensional hunt. Once the search is on, set-pieces involving flowers and tornadoes make little sense beyond their clear Oz-based influence. Alongside encounters with Zach Galifianakis’ seer and evil vagary The IT (not a clown), there’s also an overload of hokey FX. As a result, from Miller’s flummoxed expression to Winfrey’s delivery of blandly beneficent cosmic wisdoms, most of the cast seem lost. So it’s no small wonder Reid holds her own, easily capturing the sense of a teenager bottling up her emotions. Other personalising touches help DuVernay’s case: an ‘everybody hurts’ montage and Meg’s anxieties about her natural hair provide relief from the flattening default options of self-help sermonising and climactic tussles with silly CGI things. In fairness, DuVernay tackles a difficult adaptation with heart. But her gaudier distractions could have used a bypass or two.